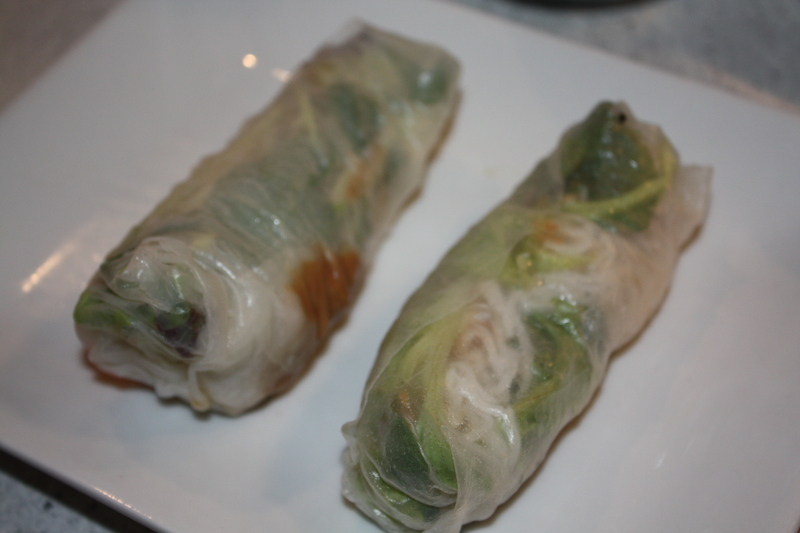 Our mother makes delicious Vietnamese fresh spring rolls or gỏi cuốn. She makes both with sliced pork and shrimp or vegetarian (chay) when we go to temple. 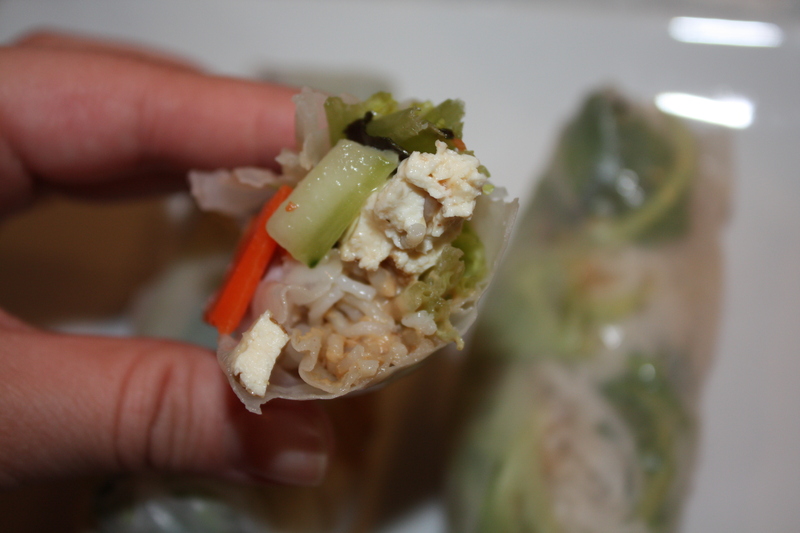 Dipping the rolls in some peanut sauce or nuoc cham enhances the flavor of the herbacious, tofu and vermicelli filled rolls. Whenever we are asked to introduce friends to Vietnamese cuisine we take them to Pho Pasteur, Pho Lemongrass, Xinh Xinh or Pho Hoa. 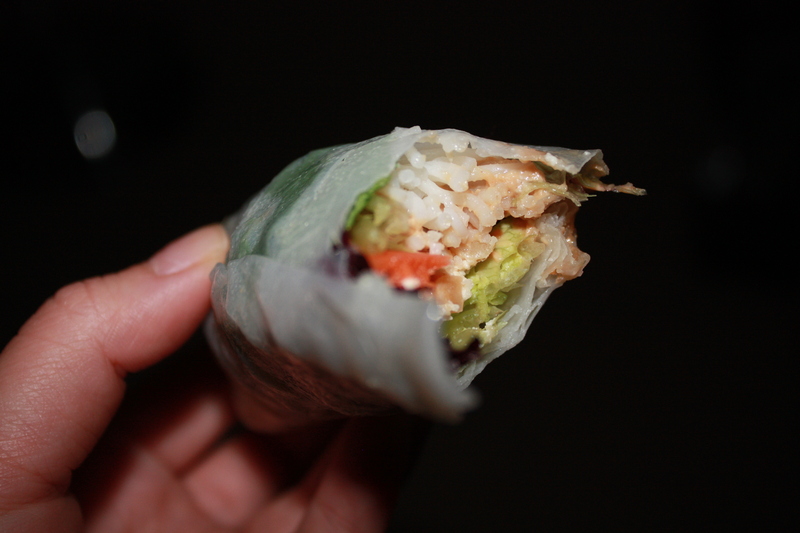 In terms of gỏi cuốn, we think Pho Pasteur makes fantastic spring rolls, but you can not go wrong anywhere. Bring a pot of water to a boil and cook the vermicelli rice noodles for one minute, then drain and rinse in cold water, but reserve the water pot for the carrot. Set aside noodles. Fill a large bowl with super hot water to moisten the rice paper wrapper. Submerge a single dry wrapper in the water and immediately make each fresh roll. Do not dip all the wrappers first, this an individual process and you have to moisten the rice wrapped first and then wrap the rolls individually. Work very quickly, as the rice paper wrappers are sticky and if you wait for sometime, they will dry back up. Place the individually moistened wrapped on a plate or cutting board and place wrapper flat. Place a small portion (at your discretion) of each component herbs, tofu, and vegetables on the bottom side of the wrapper closet to you. Add a spoon of peanut sauce and make sure each bite will have a little of each component throughout the roll. Wrap the roll up by taking the edge closest to you and flipping it up over the little mound of filling. Gently roll the filling up until you’ve just past the halfway point, then pull the sides in and roll it the rest of the way. In a small sauce pan, add water Hoisin sauce and peanut butter. Stir until peanut butter is dissolved and the sauce thickens. Add additional peanut butter until desired thickness is obtained. Garnish sauce with chopped peanuts.